To the extent our leaders have cared about climate change, they’ve fixed on CO2. Partly as a result, coal-fired power plants have begun to close across the country. They’ve been replaced mostly with ones that burn natural gas, which is primarily composed of methane. Because burning natural gas releases significantly less carbon dioxide than burning coal, CO2 emissions have begun to trend slowly downward, allowing politicians to take a bow. But this new Harvard data, which comes on the heels of other aerial surveys showing big methane leakage, suggests that our new natural-gas infrastructure has been bleeding methane into the atmosphere in record quantities. And molecule for molecule, this unburned methane is much, much more efficient at trapping heat than carbon dioxide. 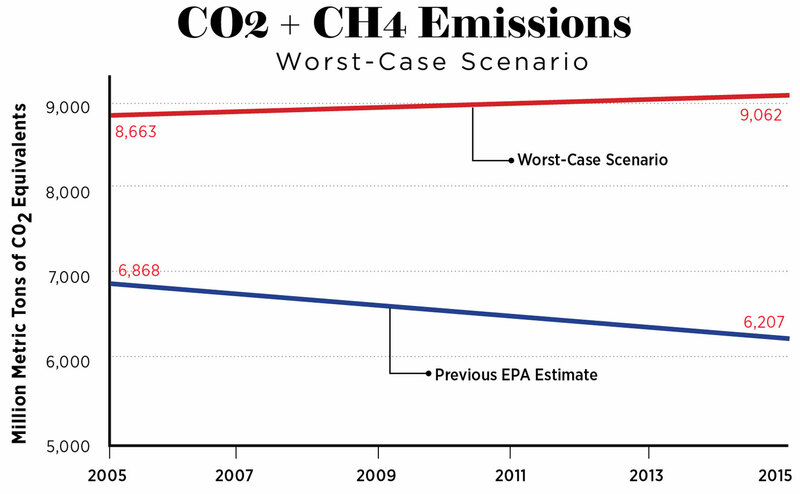 The EPA insisted this wasn’t happening, that methane was on the decline just like CO2. But it turns out, as some scientists have been insisting for years, the EPA was wrong. Really wrong. This error is the rough equivalent of the New York Stock Exchange announcing tomorrow that the Dow Jones isn’t really at 17,000: Its computer program has been making a mistake, and your index fund actually stands at 11,000. The Obama administration, to its credit, seems to be waking up to the problem. Over the winter, the EPA began to revise its methane calculations, and in early March, the United States reached an agreement with Canada to begin the arduous task of stanching some of the leaks from all that new gas infrastructure. But none of this gets to the core problem, which is the rapid spread of fracking. Carbon dioxide is driving the great warming of the planet, but CO2 isn’t doing it alone. It’s time to take methane seriously. To understand how we got here, it’s necessary to remember what a savior fracked natural gas looked like to many people, environmentalists included. As George W. Bush took hold of power in Washington, coal was ascendant, here and around the globe. Cheap and plentiful, it was most visibly underwriting the stunning growth of the economy in China, where, by some estimates, a new coal-fired power plant was opening every week. The coal boom didn’t just mean smoggy skies over Beijing; it meant the planet’s invisible cloud of carbon dioxide was growing faster than ever, and with it the certainty of dramatic global warming. So lots of people thought it was great news when natural-gas wildcatters began rapidly expanding fracking in the last decade. Fracking involves exploding the sub-surface geology so that gas can leak out through newly opened pores; its refinement brought online new shale deposits across the continent—most notably the Marcellus Shale, stretching from West Virginia up into Pennsylvania and New York. The quantities of gas that geologists said might be available were so vast that they were measured in trillions of cubic feet and in centuries of supply. The apparently happy fact was that when you burn natural gas, it releases half as much carbon dioxide as coal. A power plant that burned natural gas would therefore, or so the reasoning went, be half as bad for global warming as a power plant that burned coal. Natural gas was also cheap—so, from a politician’s point of view, fracking was a win-win situation. You could appease the environmentalists with their incessant yammering about climate change without having to run up the cost of electricity. It would be painless environmentalism, the equivalent of losing weight by cutting your hair. It’s possible that America’s contribution to global warming increased during the Obama years. Obama had plenty of help selling natural gas—from the fossil-fuel industry, but also from environmentalists, at least for a while. Robert Kennedy Jr., who had enormous credibility as the founder of the Waterkeeper Alliance and a staff attorney at the Natural Resources Defense Council, wrote a paean in 2009 to the “revolution…over the past two years [that] has left America awash in natural gas and has made it possible to eliminate most of our dependence on deadly, destructive coal practically overnight.” Meanwhile, the longtime executive director of the Sierra Club, Carl Pope, had not only taken $25 million from one of the nation’s biggest frackers, Chesapeake Energy, to fund his organization, but was also making appearances with the company’s CEO to tout the advantages of gas, “an excellent example of a fuel that can be produced in quite a clean way, and shouldn’t be wasted.” (That CEO, Aubrey McClendon, apparently killed himself earlier this month, crashing his car into a bridge embankment days after being indicted for bid-rigging.) Exxon was in apparent agreement as well: It purchased XTO Energy, becoming the biggest fracker in the world overnight and allowing the company to make the claim that it was helping to drive emissions down. Unless, of course, you happened to live in the fracking zone, where nightmares were starting to unfold. In recent decades, most American oil and gas exploration had been concentrated in the western United States, often far from population centers. When there were problems, politicians and media in these states paid little attention. The Marcellus Shale, though, underlies densely populated eastern states. It wasn’t long before stories about the pollution of farm fields and contamination of drinking water from fracking chemicals began to make their way into the national media. In the Delaware Valley, after a fracking company tried to lease his family’s farm, a young filmmaker named Josh Fox produced one of the classic environmental documentaries of all time, Gasland, which became instantly famous for its shot of a man lighting on fire the methane flowing from his water faucet. In the end, one of the most important outcomes of the antifracking movement may have been that it attracted the attention of a couple of Cornell scientists. Living on the northern edge of the Marcellus Shale, Robert Howarth and Anthony Ingraffea got interested in the outcry. While everyone else was focused on essentially local issues—would fracking chemicals get in the water supply?—they decided to look more closely at a question that had never gotten much attention: How much methane was invisibly being leaked by these fracking operations? Natural gas was also cheap—so, from a politician’s point of view, fracking was a win-win situation. Because here’s the unhappy fact about methane: Though it produces only half as much carbon as coal when you burn it, if you don’t—if it escapes into the air before it can be captured in a pipeline, or anywhere else along its route to a power plant or your stove—then it traps heat in the atmosphere much more efficiently than CO2. Howarth and Ingraffea began producing a series of papers claiming that if even a small percentage of the methane leaked—maybe as little as 3 percent—then fracked gas would do more climate damage than coal. And their preliminary data showed that leak rates could be at least that high: that somewhere between 3.6 and 7.9 percent of methane gas from shale-drilling operations actually escapes into the atmosphere. The trouble for the fracking establishment was that new research kept backing up Howarth and Ingraffea. In January 2013, for instance, aerial overflights of fracking basins in Utah found leak rates as high as 9 percent. “We were expecting to see high methane levels, but I don’t think anybody really comprehended the true magnitude of what we would see,” said the study’s director. But such work was always piecemeal, one area at a time, while other studies—often conducted with industry-supplied data—came up with lower numbers. That’s why last month’s Harvard study came as such a shock. It used satellite data from across the country over a span of more than a decade to demonstrate that US methane emissions had spiked 30 percent since 2002. The EPA had been insisting throughout that period that methane emissions were actually falling, but it was clearly wrong—on a massive scale. In fact, emissions “are substantially higher than we’ve understood,” EPA Administrator Gina McCarthy admitted in early March. The Harvard study wasn’t designed to show why US methane emissions were growing—in other parts of the world, as new research makes clear, cattle and wetlands seem to be causing emissions to accelerate. But the spike that the satellites recorded coincided almost perfectly with the era when fracking went big-time. Since Howarth is an outspoken opponent of fracking, I ran the Harvard data past an impeccably moderate referee, the venerable climate-policy wonk Dan Lashof. A UC Berkeley PhD who has been in the inner circles of climate policy almost since it began, Lashof has helped write reports from the Intergovernmental Panel on Climate Change and craft the Obama administration’s plan to cut coal-plant pollution. The longtime head of the Clean Air Program at the Natural Resources Defense Council, he is now the chief operations officer of billionaire Tom Steyer’s NextGen Climate America. We closed coal plants and opened methane leaks, and the result is that things have gotten worse. 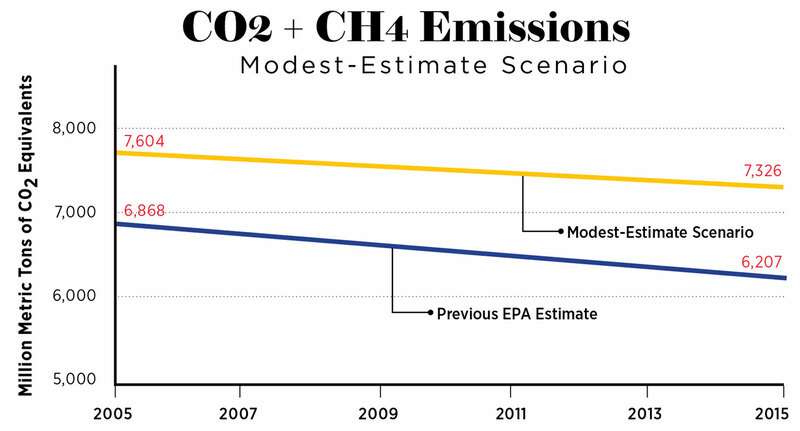 Under the worst-case scenario—one that assumes that methane is extremely potent and extremely fast-acting—the United States has actually slightly increased its greenhouse-gas emissions from 2005 to 2015. That’s the chart below: the blue line shows what we’ve been telling ourselves and the world about our emissions—that they are falling. The red line, the worst-case calculation from the new numbers, shows just the opposite. Lashof argues for a more moderate reading of the numbers (calculating methane’s impact over 50 years, for instance). But even this estimate—one that attributes less of the methane release to fracking—wipes out as much as three-fifths of the greenhouse-gas reductions that the United States has been claiming. This more modest reassessment is the yellow line in the chart below; it shows the country reducing its greenhouse-gas emissions, but by nowhere near as much as we had thought. The lines are doubtless not as smooth as the charts imply, and other studies will provide more detail and perhaps shift the calculations. But any reading of the new data offers a very different version of our recent history. Among other things, either case undercuts the statistics that America used to negotiate the Paris climate accord. It’s more upsetting than the discovery last year that China had underestimated its coal use, because China now appears to be cutting back aggressively on coal. If the Harvard data hold up and we keep on fracking, it will be nearly impossible for the United States to meet its promised goal of a 26 to 28 percent reduction in greenhouse gases from 2005 levels by 2025. One obvious conclusion from the new data is that we need to move very aggressively to plug as many methane leaks as possible. 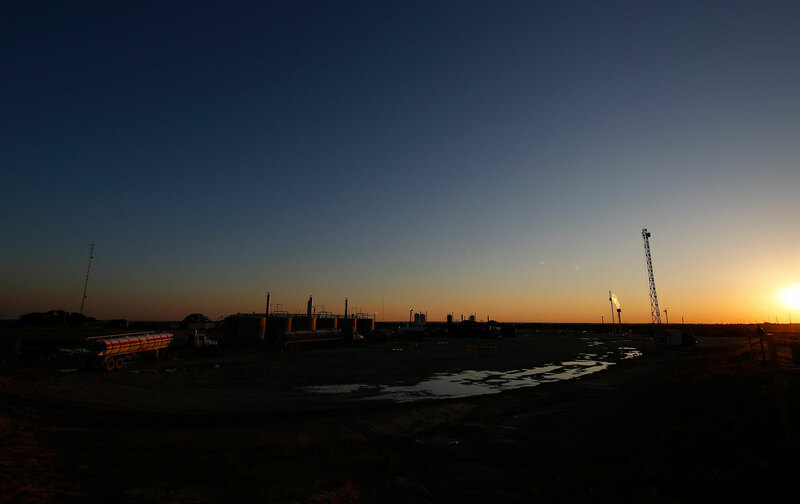 “The biggest unfinished business for the Obama administration is to establish tight rules on methane emissions from existing [wells and drill sites],” Lashof says. That’s the work that Obama and Canadian Prime Minister Justin Trudeau promised to tackle at their conclave in March—although given the time it takes for the EPA to draft new rules, it will likely be long after Obama’s departure before anything happens, and the fossil-fuel industry has vowed to fight new regulations. And if we didn’t frack, what would we do instead? Ten years ago, the realistic choice was between natural gas and coal. But that choice is no longer germane: Over the same 10 years, the price of a solar panel has dropped at least 80 percent. New inventions have come online, such as air-source heat pumps, which use the latent heat in the air to warm and cool houses, and electric storage batteries. We’ve reached the point where Denmark can generate 42 percent of its power from the wind, and where Bangladesh is planning to solarize every village in the country within the next five years. We’ve reached the point, that is, where the idea of natural gas as a “bridge fuel” to a renewable future is a marketing slogan, not a realistic claim (even if that’s precisely the phrase that Hillary Clinton used to defend fracking in a debate earlier this month). Of course, if you’re a cookie company, that’s not what you want to hear. And the Exxons have a little more political juice than the Keeblers. To give just one tiny example, during his first term, Obama’s then–deputy assistant for energy and climate change, Heather Zichal, headed up an interagency working group to promote the development of domestic natural gas. The working group had been formed after pressure from the American Petroleum Institute, the chief fossil-fuel lobbying group, and Zichal, in a talk to an API gathering, said: “It’s hard to overstate how natural gas—and our ability to access more of it than ever—has become a game changer, and that’s why it’s been a fixture of the president’s ‘All of the Above’ energy strategy.” Zichal left her White House job in 2013; one year later, she took a new post on the board of Cheniere Energy, a leading exporter of fracked gas. In the $180,000-a-year job, she joined former CIA head John Deutch, who once led an Energy Department review of fracking safety during the Obama years, and Vicky Bailey, a commissioner of the Federal Energy Regulatory Commission under Bill Clinton. That’s how it works. To take just one example, an article in Mother Jones based on the WikiLeaks cables reveals what happened when fracking came to Bulgaria. In 2011, the country signed a $68 million deal with Chevron, granting the company millions of acres in shale-gas concessions. The Bulgarian public wasn’t happy: Tens of thousands were in the streets of Sofia with banners reading Stop Fracking With Our Water. But when Clinton came for a state visit in 2012, she sided with Chevron (one of whose executives had bundled large sums for her presidential campaign in 2008). In fact, the leaked cables show that the main topic of her meetings with Bulgaria’s leaders was fracking. Clinton offered to fly in the “best specialists on these new technologies to present the benefits to the Bulgarian people,” and she dispatched her Eurasian energy envoy, Richard Morningstar, to lobby hard against a fracking ban in neighboring Romania. Eventually, they won those battles—and today, the State Department provides “assistance” with fracking to dozens of countries around the world, from Cambodia to Papua New Guinea. So if the United States has had a terrible time tracking down and fixing its methane leaks, ask yourself how it’s going to go in Bulgaria. If Canada finds that sealing leaks is an “unresolved engineering challenge,” ask yourself how Cambodia’s going to make out. If the State Department has its way, then in a few years Harvard’s satellites will be measuring gushers of methane from every direction. Of course, we can—and perhaps we should— forgive all that past. The information about methane is relatively new; when Obama and Clinton and Zichal started backing fracking, they didn’t really know. They could have turned around much earlier, like Kennedy or the Sierra Club. But what they do now will be decisive. The new data prove them entirely wrong. The global-warming fight can’t just be about carbon dioxide any longer. Those local environmentalists, from New York State to Tasmania, who have managed to enforce fracking bans are doing as much for the climate as they are for their own clean water. That’s because fossil fuels are the problem in global warming—and fossil fuels don’t come in good and bad flavors. Coal and oil and natural gas have to be left in the ground. All of them.